Bibim guksu, a cold dish made with very thin wheat flour noodles called somyun with added flavorings, is one of the most popular traditional noodle dishes in Korean cuisine. It is also called guksu bibim which literally mean stirred noodles or mixed noodles. The dish is especially popular during the summer season much like another similar Korean noodle dish called jjolmyun. There are many kinds of cold noodle dishes in Korea, including one made with cold beef broth; however, spicy cold noodles have historically been appreciated by spicy food lovers in Korea and also recognized internationally. 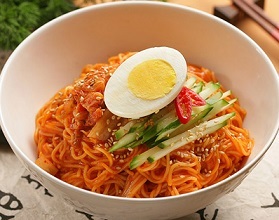 What makes this dish so distinct from other cold noodle dishes from different cultures is the strong spicy flavor produced from the combination of gochugaru (red chili pepper flakes), gochujang (red chili pepper paste), and minced garlic, along with a sweet-and-sour flavor created by vinegar and sugar. Most spicy cold noodles are prepared with a slight touch of sesame oil to enhance the richness of its flavor. Typically the dish would be prepared by stir frying diced beef, julienned pickled cucumbers, and mushrooms in sesame oil, which is all mixed together with the cooked noodles, soy sauce, sesame oil, sesame seeds and sugar. Garnishes placed on top and around the spicy noodles include hard-boiled eggs, pickled radish, dried layer strips, cabbage, sesame leaves, and sometimes sliced Korean pear.